Product #1316 | SKU CONVMUDC | 0.0 (no ratings yet) Thanks for your rating! 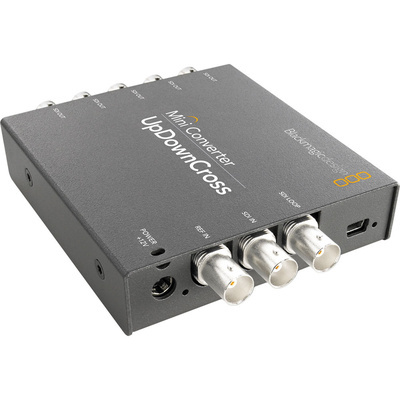 The Mini Convertor UpDownCross from Blackmagic Design converts between SD and HD video formats and functions as a 4-field standards convertor. It allows you to cross-convert 720p to 1080i, enabling editing and mastering in SD, 720p, and 1080i video. It uses the 10-bit SDI video quality with multi-tap image filtering and processing. The mini convertor includes auto SD/HD switching, which allows the convertor to instantly switch between SD and HD video formats automatically when the video input changes. Compatible with 3G-SDI technology, the convertor includes a built-in USB connection for future updates and video format compatibility. The convertor's low SDI jitter allows you to use long SDI cable lengths in conjunction with internal power supplies; this enables ultra low-noise broadcast-quality analogue video and audio over long distances. It supports multi-channel audio with automatic delay for matching any video processing delay. The Mini Convertor's settings are controlled using the built-in DIP switches or via USB using the control software for Max OS X or Windows computers, which can be downloaded on Blackmagic Design's website. The USB port also enables the firmware to be updated. For powering the device, a 12V power supply is included with international socket adapters.